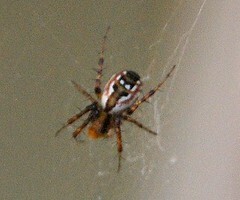 Do you see a face in the pattern on the spider's abdomen? If you see one, please describe the face or creature that you see. Other than not knowing his name, that was my response exactly. I don't see a face; I see a MASK. To me, this looks like one of those painted masks that I sometimes see as decorations on walls or in skiffy art shows. I can easily see this spider standing in front of others going, Okay, folks... I don't understand it but these humans called Producers, are willing to pay us big bucks to get out here on webs, dressed up like this, and bounce up and down while someone beats on drums. Who besides me is willing to wear one of these masks? The helpful paperclip from Microssoft Word dressed up in a paintbrush costume? Oooooo! Now I want to go outside and smash that stupid spider. And to think, I used to think it was cute. A guy in face paint wearing an old-fashioned football helmet, or one of the open-cage type helmets and face masks they now use in ...um....wrestling? Except for the nose, which is either painted bigger to be scary, or belongs to that ape-like critter with the floppy nose. Proboscis monkey or something? The face looks like a mandrill to me.